The image of the great white shark emerging from the depths of the ocean to terrorize a crowded coastline is a popular one, but it might not necessarily be the best representation of how the great white spends its days. 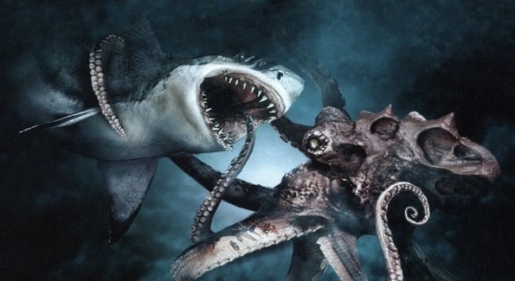 In fact, if research is correct, the great white shark might actually spend its time in the deep ocean waters out in the middle of the Pacific, terrorizing giant squid in a never-ending battle for ocean dominance the likes of which was captured in the SyFy classic, Mega Shark vs Giant Octopus. Marine biologist Michael Domeier of the Marine Conservation Science Institute put forth this controversial claim after tagging and tracking 22 great white sharks and studying their habits. Rather than head to the coast for easier prey and bigger fish population, the sharks in the survey actually headed away from shore towards deep waters in a very specific migration pattern that ended in the same spot in the middle of the Pacific Ocean. That area, considered a biological desert due to the lack of sea life, was home to only one major food supply: giant squid. Of course, the squid also attracted other predators, like sperm whales, so it’s possible that the sharks were feeding on them, too. Still, it goes to prove that there’s no creature so gigantic and tough that it’s not shark feed. At least, potentially.